Yovani Gallardo is slated to toe the rubber today in St. Louis. Gallardo has been nothing short of dazzling so far in 2014 and currently sports a 1.42 ERA over 31.2 innings. He’s getting a groundball rate of over 50% and has done a spectacular job of keeping the ball in the park. But the Cardinals, as any Brewers fan knows, present a different kind of challenge. It’s not worth it to rehash how historically awful Gallardo has pitched against the Cardinals. Don’t look, it’ll just depress you. Especially the 2011 NLCS start where he gave up four runs in the first inning. The Cardinals have pretty much destroyed him. Let’s just leave it at that. But we’re not going to dwell on those many, many, many terrible games. Nope, today we’re thinking only positive thoughts, which brings me to Yovani’s start on May 25, 2009. 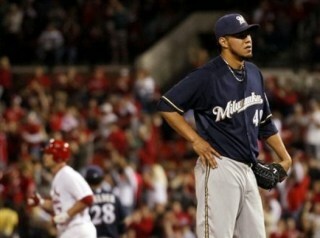 At Miller Park, before a crowd of 43,000, Gallardo spun eight shutout innings. It took 126 pitches, the most Gallado threw in any single game that year, as he walked four batters. Still, he allowed just two hits and fanned six, amazing considering Gallardo benefited from just nine swinging strikes the entire game. It’s easy to look at the lineup and note the absence of Matt Holliday and Ryan Ludwick, but Albert Pujols and Yadier Molina were in there, so it wasn’t exactly a AAA squad. Despite Yo’s brilliant start, the Brewers couldn’t muster even a single run in regulation. They finally broke it open in the 10th on an RBI single from, of all people, Bill Hall. It’s Brewers vs. Cardinals in St. Louis tonight at 7:15. If you’re a Brewers fan, here’s hoping that made you slightly more optimistic. This entry was posted in Odds & Ends, Team Analysis and tagged Milwaukee Brewers, St Louis Cardinals, Yovani Gallardo. Bookmark the permalink.